Had a game with the Beta version of the Dark Angels against Norto playing Sisters of Battle. Wanted to try out a few formations while still having a general idea with the list. Had only played against SoB once before, and was facing a very similar build this time around. Start of turn 1. 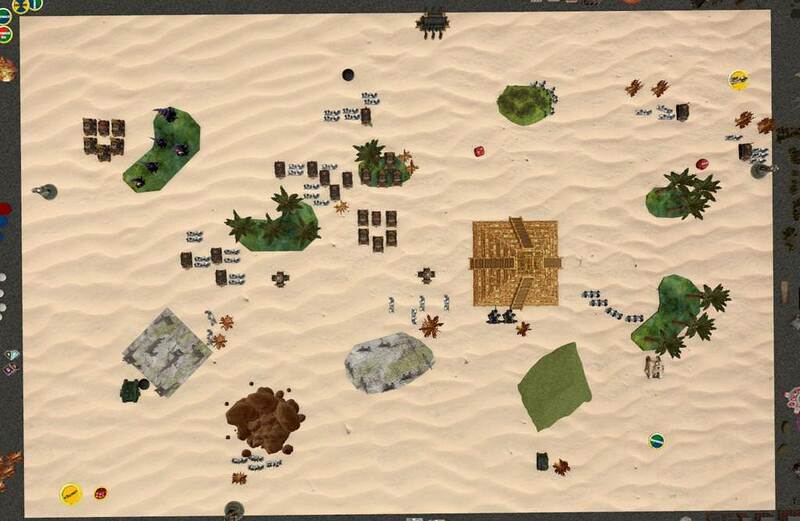 Land Raiders on the left, then the Ravenwing Attack BTS with the Grand Master and the Whirlwinds next to the DA Blitz. Deathwing Land Raiders are on the right next to the Assault Marines. 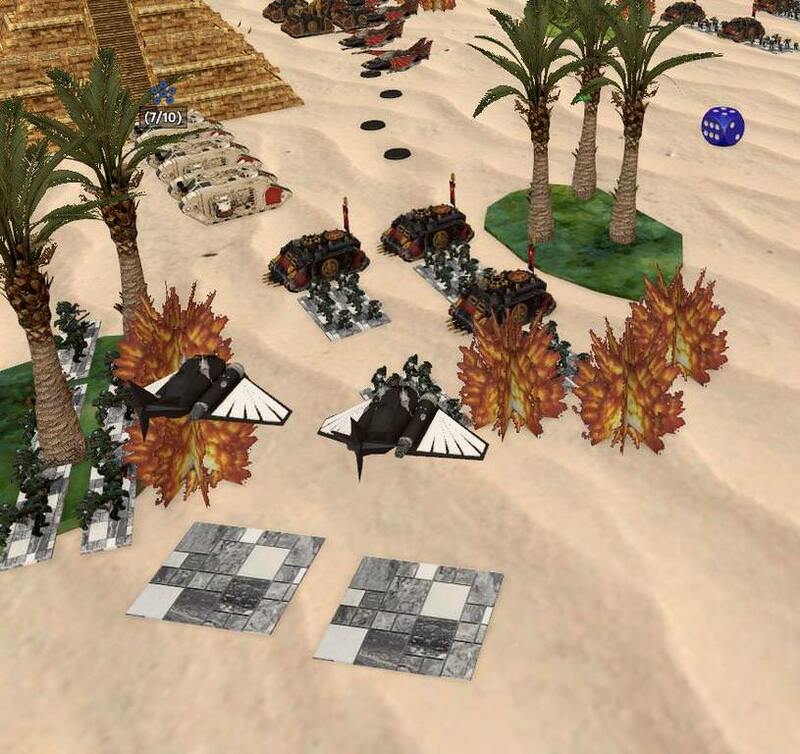 Land Speeder Venegances have garrisoned next to he Pyramid, while the Tornados are behind the forest. The Scouts are in the ruins. On the SoB side, there are Battle Sisters on the left, next to a formation of Exorcists. After that are a formation of Dominion Sisters. By the SoB Blitz are 2 more formations of Exorcists and a formation of Arco-Flagellants. On the right, two more formations of Battle Sisters (one of which is the SoB BTS) and Dominion Sisters. SoB chooses not to teleport Seraphim Sisters. Dark Angels teleports Deathwing Cyclone Terminators next to the Tornados in the forest to benefit from their Teleport Homer. Dark Angels wins the strategy roll. 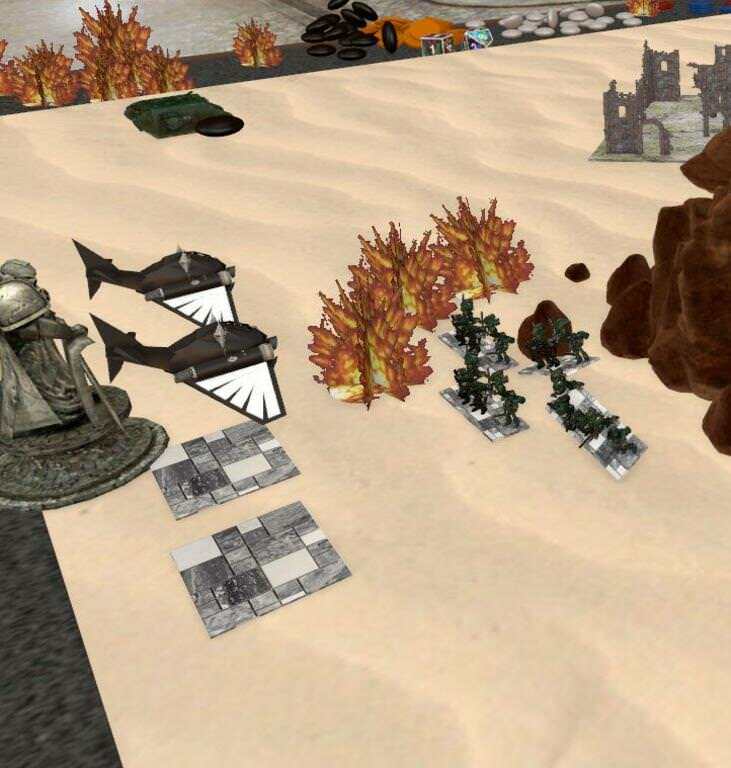 Turn 1, Activation 2, SoB: Lightning Strike Fighters ground attacks the Land Speeder Venegance formation, 1 BM. 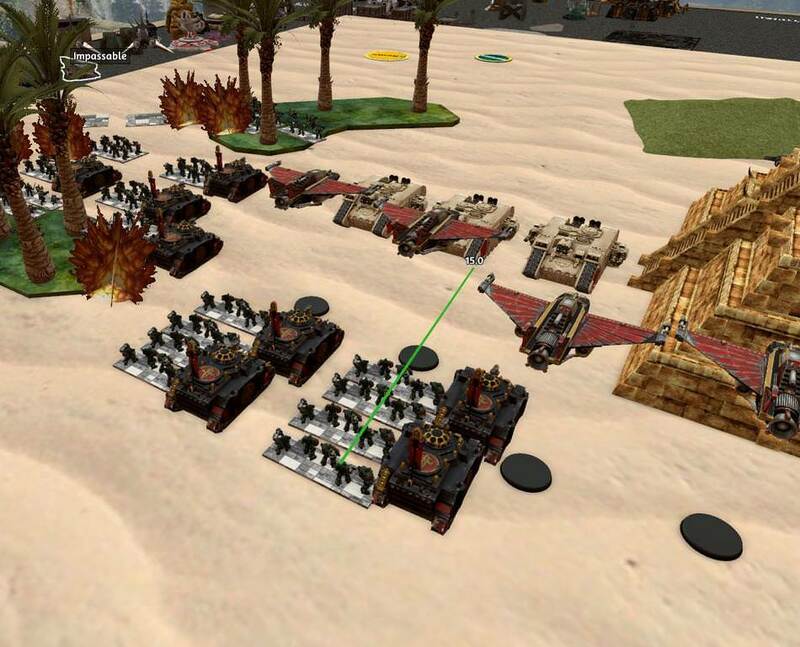 Turn 1, Activation 3, DA: Land Raiders doubles and fires at Battle Sisters, kills 1 Rhino, 2BM. 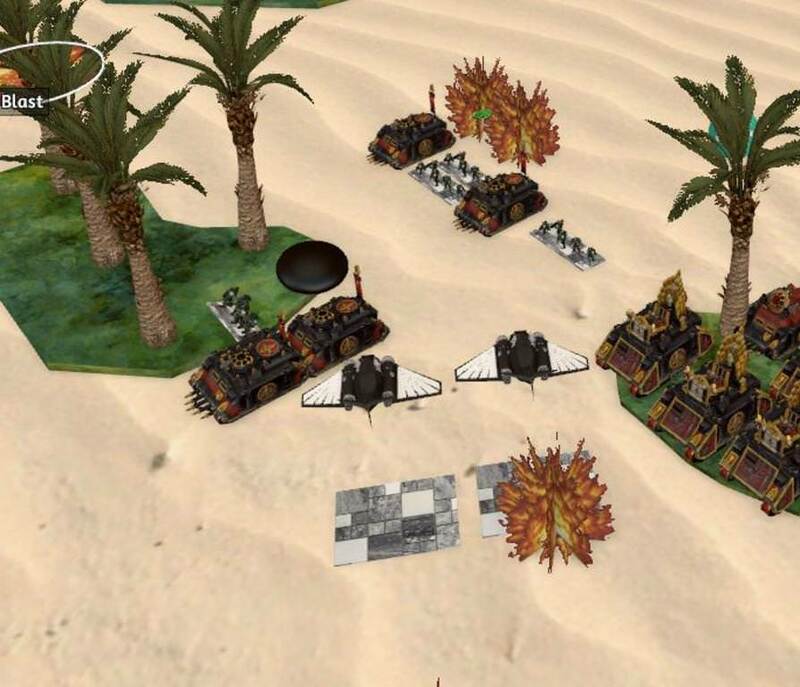 Turn 1, Activation 4, SoB: Lightning Strike Fighter ground attacks the Land Speeder Venegance formation, kills 1, 2 BMs. 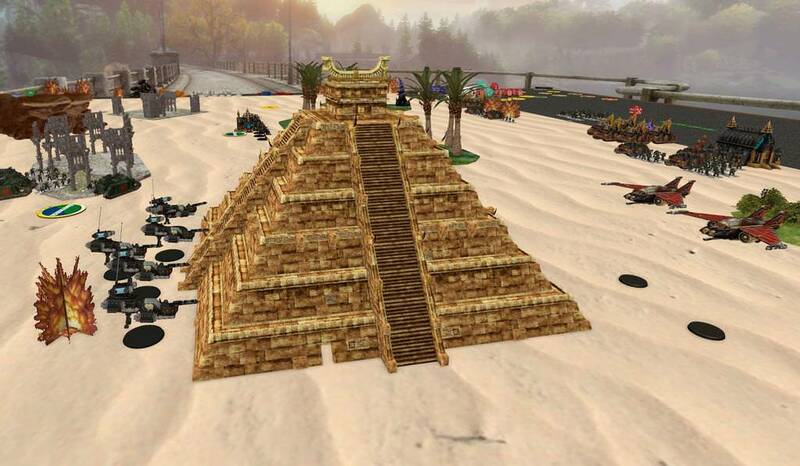 Turn 1, Activation 5, DA: Land Speeder Venegance formation Marshalls and moves closer to the pyramid. Turn 1, Activation 6, SoB: Battle Sisters attempts to double Faithfully (-1 to activate), fails and removes BMs. 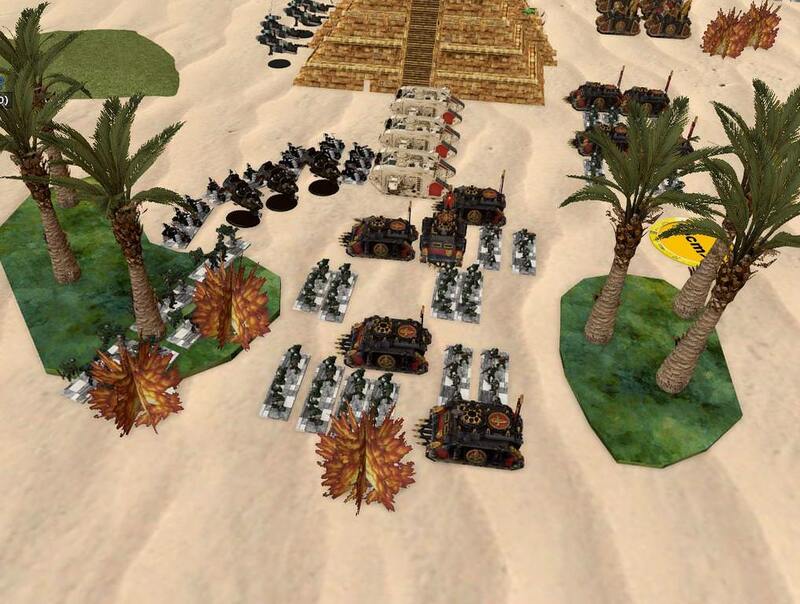 Turn 1, Activation 7, DA: Assault Marines doubles. Turn 1, Activation 8, SoB: Exorcists attempts to double Faithfully, fails and removes BMs. 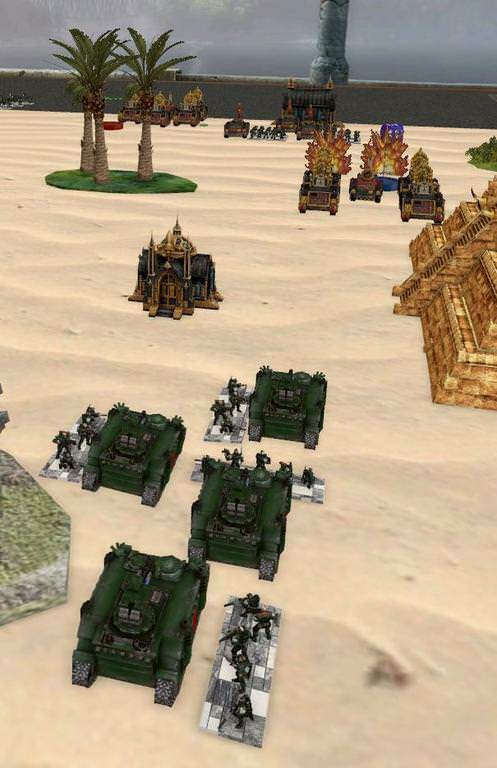 Turn 1, Activation 9, DA: Deathwing Land Raiders doubles and gives the Dominions 1BM. Turn 1, Activation 10, SoB: Exorcists doubles Faithfully, kills 1 Land Speeder Tornado, 2BMs. Turn 1, Activation 11, DA: Scouts Advances and kills 1 Exorcist, 2BMs. Turn 1, Activation 12, SoB: Battle Sisters doubles and fires their Hvy Flamers into the forest, killing 1 Assault Marine, 2BMs. Turn 1, Activation 13, DA: Dark Talons ground attacks the Batte Sisters, kills 1 Rhino and 1 Disrupt hit, 3 BMs. Turn 1, Activation 14, SoB: Dominion Sisters doubles to support the Battle Sisters. 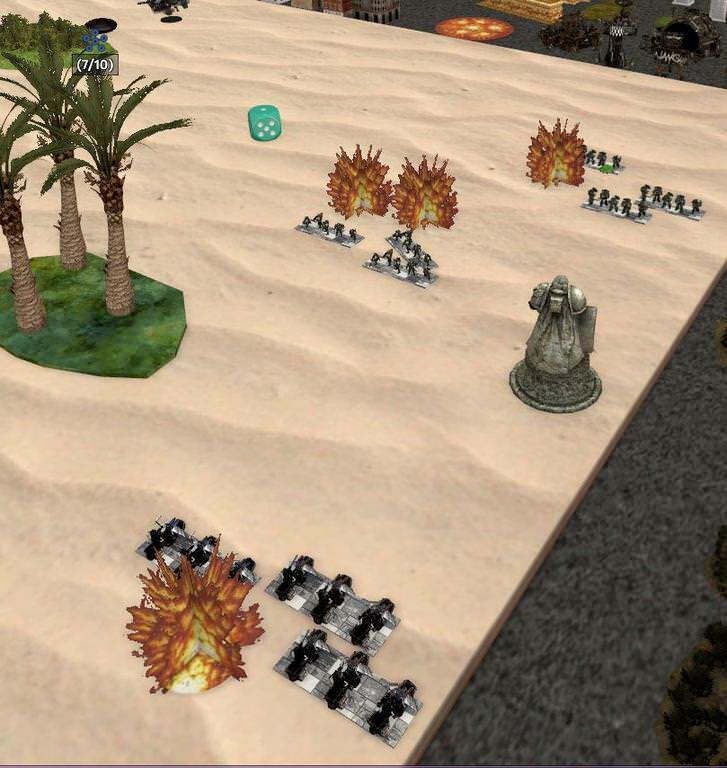 Turn 1, Activation 15, DA: Land Speeder Tornados Advances as fires at the Exorcists, 1BM. Turn 1, Activation 16, SoB: Dominion Sisters Marshalls and moves Faithfully. Turn 1, Activation 17, DA: Whirlwinds Sustain Fire on the Exorcists, 3 hits and 3 saves, 1BM. Turn 1, Activation 18, SoB: SoB BTS doubles and gives the Deathwing Land Raiders 1BM. 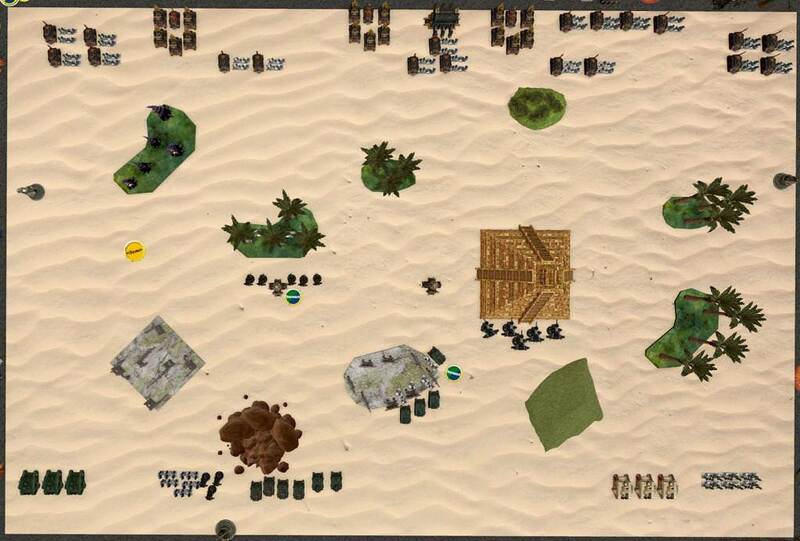 Turn 1, Activation 19, DA: Ravenwing Attack (DA BTS) Marches. DA is out of activations. Turn 1, Activation 20, SoB: Arco-Flagellants attempts to double, fails and moves. Turn 1, Activation 21, SoB: Exorcists advances and kills 1 LR with 7 hits, 2 BM. Start of turn 2. Seraphim Sisters teleport down close to the DA Whirlwinds, no BMs from teleporting. 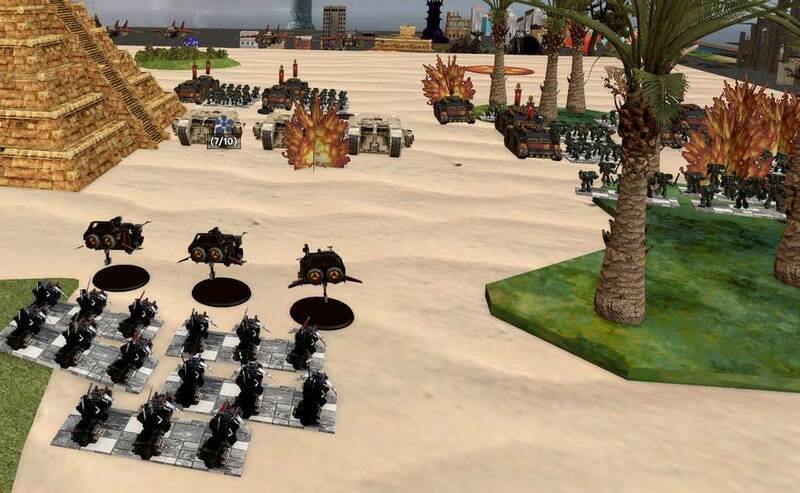 Turn 2, Activation 1, DA: Ravenwing Attack engages the Battle Sisters and the Dominions, Battle Sister Rhino pulls in the nearby Deathwing Land Raiders into the fight. 6 kills for SoB, 5 for DA, SoB leads by one but loses the rolloff and breaks. Deathwing Land Raiders suffers two casualties and breaks. 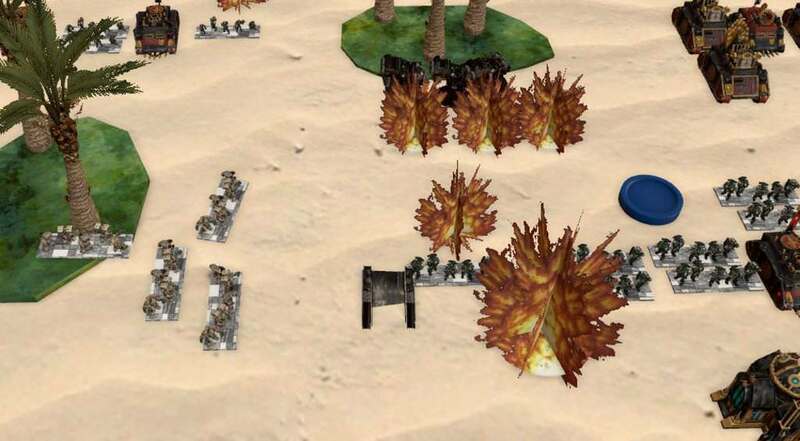 Turn 2, Activation 2, DA Retain: Land Speeder Venegances attempts to Advance and fire at the Battle Sister BTS, fails to activate with RR, removes BM. Turn 2, Activation 3, SoB: Seraphims engage the Whirlwinds, kills 2 for no damage back, wins by 3 killing 1 extra Whirlwind. Turn 2, Activation 4, SoB Retain: Battle Sister BTS doubles Faithfully, kills 1 Land Speeder Tornado in crossfire, 3 BMs. 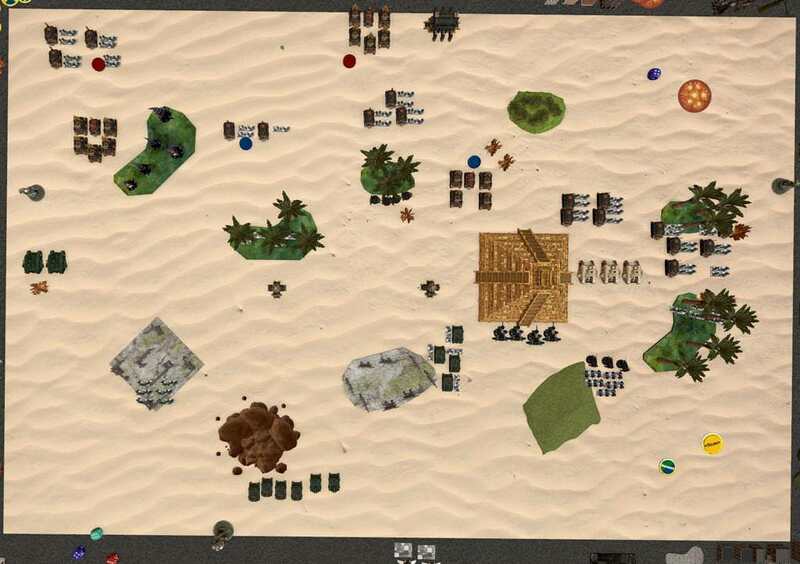 Turn 2, Activation 5, DA: Scouts advance and fires at the SoB BTS in Crossfire, killing 2 Rhinos and the Cannoness with the Scouts' Sniper Rifles. Turn 2, Activation 6, DA Retain: Land Speeder Tornados attempt to Marshall, fails and removes 2 BMs. 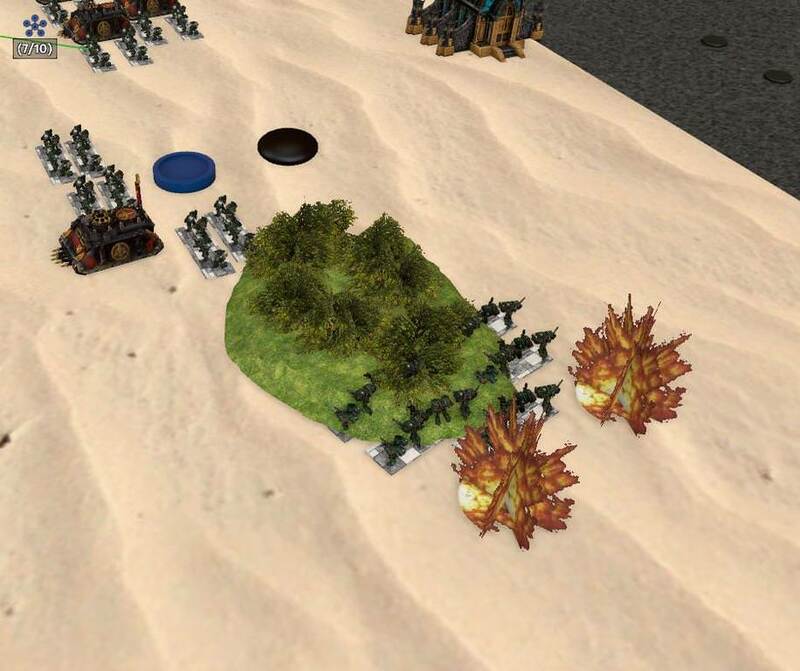 Turn 2, Activation 7, SoB: Exorcists sustains fire at the Land Raiders, kills 1 and breaks them. Turn 2, Activation 8, SoB Retain: Dominions attempt to Engage the Deatwing Cyclone Terminators Faithfully, fails and moves. Turn 2, Activation 9 DA: Cyclone Terminators engages the SoB BTS, kills 1 Rhino and 1 BS, DA wins by 2 but BTS is currently Fearless so it only breaks. Turn 2, Activation 10 DA Retain: Dark Talons ground attacks the Seraphim Sisters, kills 2 with their Rift Cannons. Turn 2, Activation 11, SoB: Exorcists engage the Land Speeder Tornados, wiping them out for no damage in return, the Deathwing Cyclone Terminators gets 1 BM for supporting. 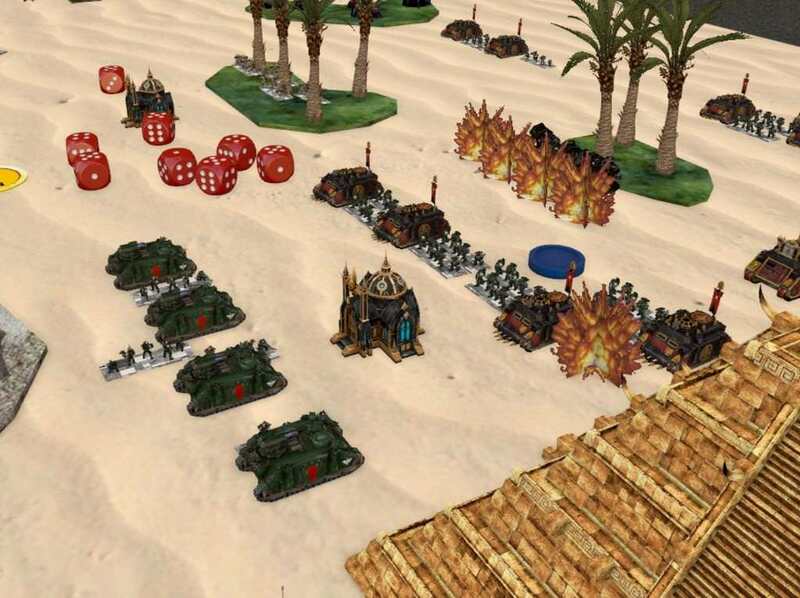 Turn 2, Activation 12 DA: Assault Marines doubles. Dark Angels is out of activations. Turn 2, Activation 13 SoB: Exorcists doubles and fires at the Scouts, kills 4 Razorbacks, 5 BMs. Turn 2, Activation 14 SoB: Arco-Flagellants engages the Deatwing Cyclone Terminators using Infiltrate, Cyclone Terminators kills 3 for 1 killed in return, fight is even but the Terminators loses the rolloff by 2 and the Librarian is hacked down. Turn 2, Activation 15 SoB: Batte Sisters March. Turn 2, Activation 16 SoB: Lightning Strike Fighters ground attacks the broken Whirlwinds, killing 2 Hunters. 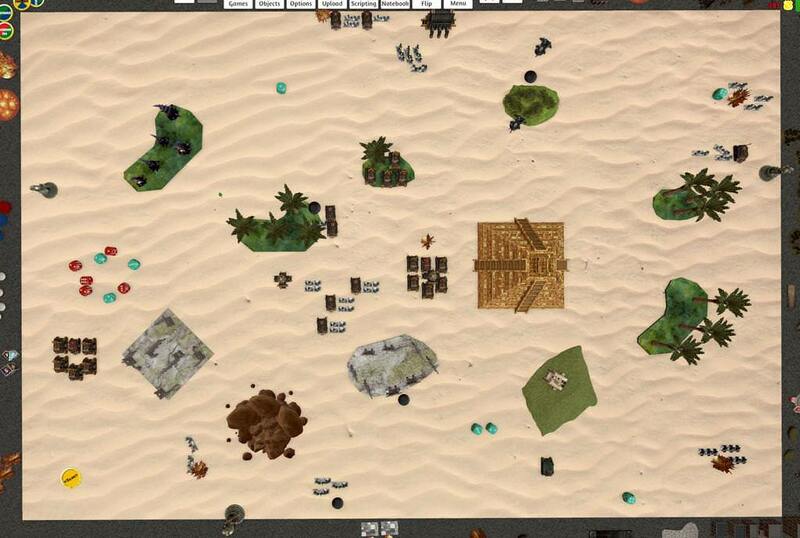 Turn 2, Activation 17 SoB: Lightning Strike Fighters ground attacks the Land Speeder Venegances, kills 2, 3 BMs. Start of turn 3. Dark Angels win the strategy roll. Turn 3, Activation 1 DA: Assault Marines engage the SoB BTS, losing 1 Assault Marine and wipes out the BTS, nearby Exorcists gets 1BM. Turn 3, Activation 2 DA Retain: Cyclone Terminators doubles using the reroll, fires at the Seraphim Sisters, 2 hits and 1 kill, Seraphim SIsters break. 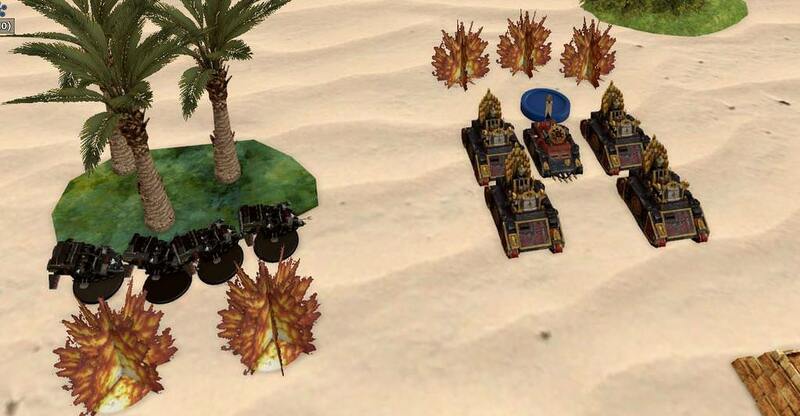 Turn 3, Activation 3 SoB: Lightning Strike Fighters ground attacks the Land Speeder Venegances, giving them 1BM. Turn 3, Activation 4 DA: The lone Whirlwind sustains fire at the intermingled Arco-Flaggelants and the Dominions, kills 1 Rhino, BMs on both. Turn 3, Activation 5 DA Retain: Scouts Marshalls and moves, removes 5 BMs. Turn 3, Activation 6 SoB: Battle Sisters Doubles and fires at the Scouts in the ruins with Hvy Flamers, killing 3, breaking them. Turn 3, Activation 7 SoB Retain: Exorcists fails to activate and moves. Turn 3, Activation 8 DA: Ravenwing Attack engages the Battle Sisters, 2 kills against 1, leads combat by 3 but loses the rolloff, both break. Turn 3, Activation 9 SoB: Dominion Sisters Marshalls. Turn 3, Activation 10 DA: Land Speeder Venegance doubles, gives the Exorcists 1 BM. Turn 3, Activation 11 SoB: Lightning Strike Fighter ground attacks the Land Speeder Venegance, giving them 1BM. Turn 3, Activation 12 DA: Dark Talons ground attacks the intermingled Arco-Flagellants and Dominion Sisters, taking 1 BM on the way in from AA, kills 2 Arco-Flagellants, breaks them. Turn 3, Activation 13 DA Retain: The lone Deathwing Land Raider advances and gives the Exorcists 1 BM. Dark Angels is out of activations. Turn 3, Activation 14 SoB: Exorcists Marshall and gives the Land Speeder Venegances 1 BM, breaking them. Turn 3, Activation 15 SoB: Exorcists doubles and kills the lone broken Land Raider. Turn 4, Activation 1 DA: Assault Marines engage the Dominions, kills 3 for 1 in return, Dominion Sisters are wiped out. Turn 4, Activation 2 DA Retain: Cyclone Terminators Advances and gives the Exorcists 1 BM. Turn 4, Activation 3 SoB: Lightning Strike Fighter ground attacks the Whirlwind, gives it 1BM. Turn 4, Activation 4 DA: The lone Whirlwind sustains at the Exorcists in the forest, killing 1 Exorcist, 2BMs. Turn 4, Activation 5 DA Retain: The lone Deathwing Land Raider Advances and fires at the Battle Sisters for 1 BM. Turn 4, Activation 6 SoB: Lightning Strike Fighters CAP. Turn 4, Activation 7 DA: Dark Talons ground attacks the Exorcists but both gets shot out of the sky by the intercepting Lightnin Strike Fighters and the Hunter. Turn 4, Activation 8 SoB: Exorcists Advance and fires at the Assault Marines, kills 1 for 2 BMs. Turn 4, Activation 9 DA: Ravenwing Attack doubles and fires at the Battle Sisters, kills the Rhino for 2 BMs. Dark Angels is out of activations. Turn 4, Activation 10 SoB: Battle Sisters doubles and gives the Ravenwing Attack 1 BM. Turn 4, Activation 11 SoB: Dominion Sisters engage the Ravenwing Attack, killing all and taking the BTS for 1 damage in return, Dominion Sisters break. Turn 4, Activation 12 SoB: Battle Sisters engage the lone Deathwing Land Raider, killing it for no damage in return. SoB has more activations after this, but since they have at this point won by 2-1 in objectives, we call the game here. While I could certainly have played (and rolled) better, in this game the Dark Angels felt they were being out-gunned, out-engaged, out-AA:d and out-numbered. Had I not won every single strategy roll things would have been even worse. Was a similar feeling to when I played against them the last time with Knight World (but much less extreme, I pretty much got curb stomped in that game). Not sure if the problem is on the DA side of the table or if certain SoB formations might be a bit too cheap. The Exorcist formations in particular appears quite spam-able, a bit like cheaper Predator Annihilators that can also shoot AP. Combined with 50 points for the Hunter (DA gets 2 for 125) they feel like a really good deal, perhaps too good. Haven't looked at the list in detail, but am a bit worried that SoB might have formations that won't be taken since there's might be a few that you really want. On the DA side I was really pleased with how the Dark Angels Assault Marines performed. The LS Venegances drew a ton of fire but didn't really manage to do much apart from that. When it was their time to shine in turn 2 they rolled snake eyes to activate... Didn't guard the Whirlwinds enough, which I got to pay for, but it was fun to see that even a single Whirlwind can be a thorn in the side of the enemy. The Land Raiders fell victim to the Exorcists and the Dominions, but I think all three varieties of Land Raider formations that DA now have with 3 units in each are both affordable, fun and quite capable. Used the Deathwing Cyclones in a semi-offensive way this game, and I think they were quite successful there. 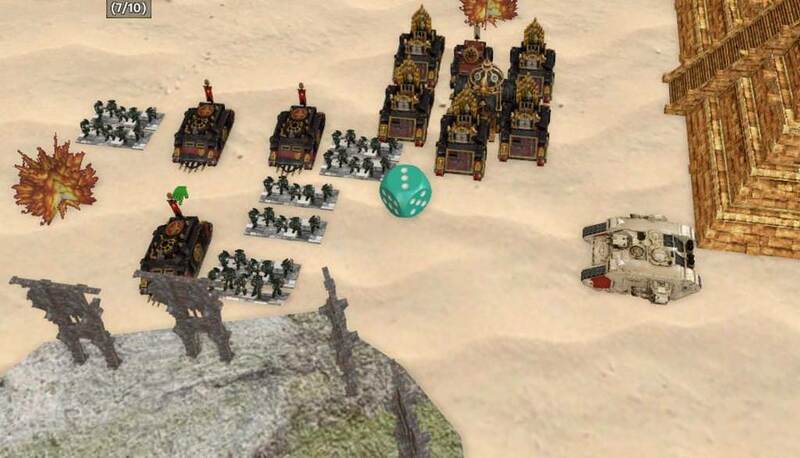 The extra range they have over the normal Terminators' Assault Cannons means that they can both move and fire like they did when breaking the Seraphim Sisters and protecting the Blitz in turn 3 and 4. The Dark Talons felt OK this game, but had Norto really wanted them dead he could probably have put some Lightnings of CAP and got them early on, instead of going after the Venegance formation like he did (they survived a ton of shots tho). Was a bit of an odd game with dice and what not. It does seam like a solid list. I think the sisters are just a better ground pounded assault list. Exorcists and annihilators are probably a good comparison but then there's TSKNF and the faithful rule to consider. Same with the hunters. More games will tell. I saw you upped the Terminators to 4+ CC, 5+ just seemed odd. They can nearly be the same as other terminators with 3 cyclone missile launchers. Not having the thunder hawks for delivery or pick up has got to be a weakness doesn't it? Teleport homing is a bonus but has to be a risk too yeah with needing the homers close and personal to deliver Terminators for CC assaults. Lose the roll off and it could be all wasted. Maybe we can swap and have a game? Definitely, and since they're the same as in the E-UK list I guess it's better to give them the benefit of the doubt. Might be worth considering not to have them as a core formation tho. Yeah, I think they should be OK with these stats. And they're also a pretty expensive support formation and lack certain character choices.